On Mar 23, 2011, at 5:54 PM, Jean wrote: "I'm thinking of buying an iPad 2 but was wondering how do you hook it up to the Interent is there a service you need? I have WiFi which sometimes I can get, but since we live in the country there are times it won't work that great. But you won't need another service to use the iPad? Does it make a difference where you buy one like at Amazon, Best Buy, Wal Mart, etc? Thanks for the help." The truth about the iPad or iPad 2 is that it much better with an Internet service than it is without one. So it is natural that one would inquire about the Internet options that are available for the iPad owners. Many of the great apps like Safari, Email, Pandora, Netflix and so many more rely on having a connection to the Internet to get their content. Even to download apps from the App store, you must have access to the Internet (from the iPad or desktop that you sync the iPad to). The iPad comes in different models; most have different storage capacity, but each device regardless of storage capacity comes in both a Wi-Fi only model and a Wi-Fi and 3G model. Let's talk about the Wi-Fi only model first. For those who own a laptop computer will recognize the following opportunities. The iPad is equipped with a Wi-Fi antenna that allows it to connect to a Wi-Fi hotspot. A Wi-Fi hotspot is a site or device that offers Internet access over a wireless local area network through the use of a router connected to a link to an Internet service provider. Hotspots may be found in coffee shops, restaurants and various other public establishments throughout much of the developed world. Some are free and other require a monthly plan or pay as you go options. Other places for hotspots are commercial and residential locations. 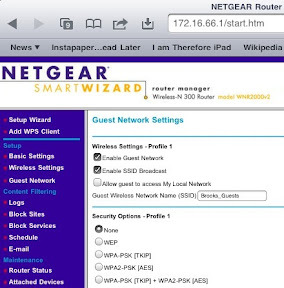 In order to have the best Internet and iPad experience, you should have control of at least one hotspot location. The first obvious place to start is your home. Most people have some sort of Internet connection in their home. Many of them are still wired connections via their local utility companies like Cable, Telephone or Satellite providers. These companies provide a modem with a connection to a single computer. Over the last few years, these companies have offered wireless plans where customers would pay an additional monthly fee to update to their wireless offers. In most cases, these plans are not required. A person could buy a wireless router from a local computer store or online and hook the provider's modem to it to accomplish the same goal. The first scenario could cost you $240 over two years if the provider's wireless option was $10 a month. This is in addition to the regular costs of cable, tv or telephone plans. The second scenario would be a one time cost of about $50 to buy the router. The Geek Squad at Best Buy charges $150 to install these, which is ridiculous over priced. Most people could follow the directions with the device to do it themselves, but if you are intimidated pay a nephew or cousin $50 to do it. So with this setup, you would extending your existing Internet service (that you are already paying) to your iPad. A second common place for access is at your place of work. Many companies offer Wi-Fi services. Some are open, meaning anyone can access them without a password. Most require that you get a password from the computer guy (or gal) to access the company hotspot. Some companies offer both a secure hotspot and a separate unsecured open hotspot for guests or visitors to their company. Even some home routers offer the same feature. My Netgear Wireless N 300 Router does this (see picture below). So when you launch the Settings app from your iPad and tap the Wi-Fi option on the left menu, you will see any Wi-Fi routers that are broadcasting (see picture below). 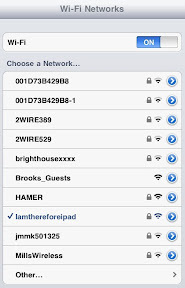 In my case, I have two: a private hotspot called "iamthereforeipad" and a public hotspot called "Brooks_Guest". Notice that most are private and have a lock icon to the right of their names. Notice my unsecured hotspot does not have a lock. This means it does not require a password. Once you venture from home or work, the picking are less predictable and with some dangers as well. Free wireless internet might sound like great deal, but it’s helpful to remember the old adage, “There’s no such thing as a free lunch.” Relying on free wireless internet can be a risky business, especially for web browsing where private information is exchanged. In 2010, Early Show Consumer Correspondent Susan Koeppen said that at least nine million people fall victim to identity theft each year. A common and effective trick of hackers is to set up a fake free wireless internet hotspot with a name like “Free Public WiFi”. These fake hotspots connect the hacker to your computer, allowing them access to personal passwords, bank account information, and other private details. Sometimes such fake hotspots are set up by accident because of a bug in the user’s operating system, but it’s better to just steer clear of hotspots with vague and misleading names. However, even actual free wireless internet hotspots, like those in upscale coffee shops, can provide dangers. Free wireless internet networks are generally unencrypted, so any information you send over the network can be seen by anyone who wants to put in a little effort. This risk is minimized on sites that use end-to-end or point-to-point encryption, signified by a web address starting with https. These sites supply their own encryption for sensitive information. Banking and online shopping sites generally make use of this technology, but many e-mail and other password-based services do not. If you have private information in your e-mail (even if it’s in your deleted items folder) and you access it using free wireless internet, that information can become accessible to malicious hackers. The safest option when using free wireless internet is to simply avoid giving out any information that you wouldn’t want to become public. If you subscribe to a secure mobile wireless internet service, you have more freedom to do private transactions on-the-go. Just remember to keep your antivirus and firewall defenses updated at all times. So have I scared you away? Still interested? Keep reading. There are restaurants locations like McDonald's and Pandera that have free hotspots. This is a growing trend, so expect to see most major chains offering this soon. Look for the Wi-Fi inside logos at locations you frequent. There are coffee shops, libraries and other locations that offer free access to access. Many are free, but require that you agree to their access agreement. Most sites will pop up the agreement screen automatically in a website page. Once you agree, you can surf the web, check and send email and use other Internet services once connected. If it does not pop up automatically, then pull up the Safari app and try to access a known site so that the prompt is triggered. So the examples that I shared so far are mainly wired Internet connections made wireless via a fixed router. This means that the Internet connection is only available if you are at those physical locations. What if you want to use your Wi-Fi only iPad while on the go? What if you want to minimize the risks of public Wi-Fi spots. There are some options for you. There are also options from the wireless companies. The newer smartphones have hotspot features that can be turned on for an additional fee. This is different than tethering, which typically require an USB cable to tether to a phone. A smartphone must have a built-in Wi-Fi router to even be eligible to be a hotspot; the wireless carrier must also offer the hotspot plan (though there may be some workarounds for certain phones). Once this plan is acquired and the hotspot feature is turned on, you can surf on your iPad through the Internet plan of your smartphone. This is usually a very low cost option for obtaining Internet for connected devices like the iPad. This hotspot is available typically for up to 4 additional devices like laptops, Wii, and others. The only draw back is that the phone's battery will drain faster if it is not plugged into a power source. Because of the iPad's huge screen, you make surf more than you did on the phone; so watch the data usage so you don't get a huge bill at the end of the month. The next wireless option from the cellular companies are the MiFi device. it basically is a cell phone without a phone option. It is a small box or card that has a rechargeable battery that is recharged via an USB cable. Prior to the smartphone option coming available, this was one of the few ways that people could get wireless on the go. The problem with this solution has always been the huge monthly cost for the service, which is typically $60 a month. This price has not dropped in as many as 10 years. These MiFi devices plans evolved from the PCMICA modem cards and USB modem cards that business people used for their laptops. These plans are good for people who want the freedom of being mobile and want to have access to the Internet from multiple devices. If you still have a PCMICA, ExpressCard or USB modem card and paying your $60 a month, you can contact your wireless provider to upgrade (typically for free if you sign up for 2 years again) to a MifI. For the same price you were paying a single connection to the Internet on your laptop, you can now have access to the Internet from your laptop and your iPad (plus 3 other devices). This is also good for single people or families where you are the only one that will use the Internet. Why pay the cable company $60 a month for Internet that is not usable to you will you are at work or on the go? If you are the only one using the Internet at home, you might consider turning it off and choosing a Mi-Fi so you can get Internet anywhere for the same $60. Just make sure your alarm or home phone is not using the home's Internet service before you cut the cord. What if you are stuck with keeping the old school modem because your company won't upgrade it? You can get a device like the CTR35, PHS300 or CTR500 mobile router from Cradlepoint, plug the modem into the device and share your Internet with up to 16-32 devices. Some of these devices may even allow you to share the Internet from your cell phone, even if it is not a smartphone. Whether you use a smartphone as a hotspot, or a Mi-Fi hotspot, or a Cradlepoint device to make your old phone, USB or ExpressCard modem into a hotspot; the device will show up in your list of available hotspots when you go to the Settings app on your iPad. All of these choices can be made secure or unsecured. These are not without dangers either. You can end up with huge data bills if you do not have the proper data plan or you have many devices connected and downloading tons of data. There are very few "unlimited" plans out there, so be careful. I hear people saying that they have unlimited plan, but unlimited means different things to different wireless carriers. Typically "unlimited" means 5GB or lower. So these are some Wi-Fi options for the "Wi-Fi only" iPad. If you choose a "3G + Wi-Fi" version you can still use any or all of the above methods, plus you have the option to paid AT&T (iPad 1 or iPad 2) or Verizon (iPad 2) for a wireless plan for on the go. You can read about those here: AT&T or Verizon: Which Carrier will Offer the Best Data Plan for the iPad 2. To answer your last question: "Does it make a difference where you buy one like at Amazon, Best Buy, Wal Mart, etc?" It doesn't make a difference if you are getting a Wi-Fi only iPad. But I always say, "You will get the best buying experience of an iPad from an Apple store"; however, everyone does not have this is an option. If you are getting a 3G version, then you have to go to an Apple store, AT&T or Verizon store. If you are going with the "router to make your home Internet service wireless option", then all of the retailers you list will sell wireless router as well; though some may have more options than others.